We present an advanced molecular-scale organic light-emitting diode (OLED) model, integrating both electronic and excitonic processes. 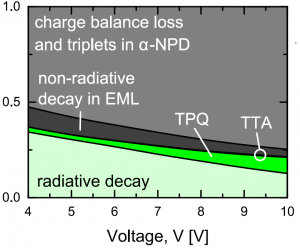 Using this model, we can reproduce the measured efficiency roll-off for prototypical phosphorescent OLED stacks based on the green dye tris[2-phenylpyridine]iridium (Ir(ppy)3) and the red dye octaethylporphine platinum (PtOEP) and study the cause of the roll-off as function of the current density. Both the voltage versus current density characteristics and roll-off agree well with experimental data. Surprisingly, the results of the simulations lead us to conclude that, contrary to what is often assumed, not triplet-triplet annihilation but triplet-polaron quenching is the dominant mechanism causing the roll-off under realistic operating conditions. Simulations for devices with an optimized recombination profile, achieved by carefully tuning the dye trap depth, show that it will be possible to fabricate OLEDs with a drastically reduced roll-off. It is envisaged that J 90, the current density at which the efficiency is reduced to 90%, can be increased by almost one order of magnitude as compared to the experimental state-of-the-art.